Did you start a new position as the leader of your church welcome committee? Do you find yourself wondering where to start with the over 1000 articles on EvangelismCoach.org? Finding a place to make a difference in the community. All of this begins as visitors connect with your church. So maybe you’ve put together a hospitality committee . . . These committee members desire to help your church grow. They want to help newcomers find a relationship with Jesus. They want newcomers to connect with members of the church. They desire to make the right moves. 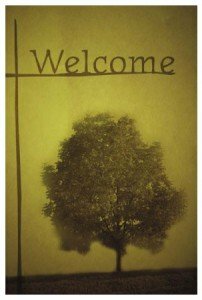 I’ve put together an e-book that is a practical ‘how-to’ manual on creating a better first impression to welcome visitors to church. Your ebook gives me a place to begin with some organization. This gives me a big picture view to analyze what we have and what is missing. You’ve given me lots of material I can use for a training meeting, or a series of training meetings. You’ve asked some penetrating questions to lead our discussions. It takes several of the most popular articles on EvangelismCoach and collects them as a downloadable product. It can help you answer the question of where you can start on this website with matters of hospitality. 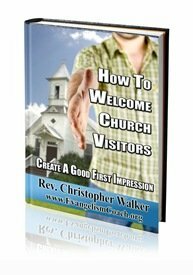 How to Welcome Church Visitors Ebook. It is a download available for purchase. No hard copy available. Hi my name is Shirley Morris I am needing help as a church usher welcome visitors into the church where I attend. We have a small congregation but as the senior leader I need more skills too better myself in teaching the youth and adults. I want to do it better and more professional as the church grows in the future.